LG announced five new smartphones today, two weeks ahead of CES 2017 in Las Vegas, but unfortunately, none of them are the rumoured LG G6. Perhaps misunderstanding consumer requests for 4K phones, LG has instead announced four mid-range K Series handsets, as well as a new LG Stylus phone. While they all sport a 120-degree wide angle front camera lens and a rear fingerprint scanner, each phone will have its own unique characteristics based on technologies from LG’s premium flagships. The standout from the K Series, the K10 features a 5.3-inch 720p (277ppi) display under a 2.5D Arc Glass design. Built on a metallic U-frame, it’s also got a 5MP front camera, 13MP rear camera, a 1.5 GHz Octa-Core chipset, 2GB of LPDDR3 RAM, a removable 2,800mAh battery and 16GB or 32GB of onboard storage (microSD up to 2TB), all within a 7.9mm profile. It’ll also run Android 7.0 Nougat out of the box. Next is the photography-focused K8, which boasts 5MP front and 13MP rear cameras which take advantage of Auto Shot and Gesture Shot UX features for next-level selfies. Slightly smaller than the K10, the K8 still packs an impressive 5-inch 720p (294ppi) display, 1.5GB of LPDDR3 RAM, 16GB of onboard storage (microSD up to 32GB), a 1.4 GHz Octa-Core chipset and a removable 2,500mAh battery. Like the K10, it too runs Android Nougat. The K4 features has a 5-inch 480p (196ppi) display, 1GB of LPDDR3 RAM, a 1.1GHz Quad-Core chipset, 8GB of onboard storage (microSD up to 32GB), a removable 2,500mAh battery and front and rear 5MP cameras. Unlike the K10 and K8, the K4 will run on Android 6.0.1 Marshmallow. 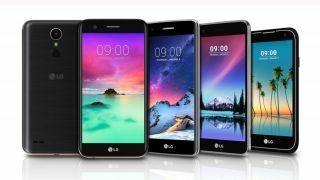 Rounding out the K Series of LG mid-range phones is the K3, which has a 4.5-inch 480p (218ppi) display, 1GB of LPDDR3 RAM, a 1.1GHz Quad-Core chipset, 8GB of onboard storage (microSD up to 32GB), a 2MP front camera and 5MP rear camera and a removable 2,100mAh battery. Like the similarly-specced K4 before it, the K3 runs on the Android Marshmallow OS. Finally, the Stylus 3 has a whopping 5.7-inch 720p (258ppi) display, 3GB of LPDDR3 RAM, a 1.5GHz Octa-Core chipset, 16GB of onboard storage (microSD up to 2TB), an 8MP front camera and 13MP rear camera, a removable 3,200mAh battery, all within a slim 7.4mm body. It runs on Android Nougat, has FM radio capability, and, as the name would suggest, comes with a stylus pen. Pricing, market availability and release date details for the handsets have yet to be announced, but we can expect to learn more about LG's new range at CES in a couple of weeks.